Austrian physician and professor of physiology at the University of Lemberg; born Jan. 1, 1863, in Cracow, Galicia, of poor parents. During his academic career Beck supported himself as a private tutor. Upon graduating with distinction from the gymnasium of his native city in 1884, he entered the University of Cracow. 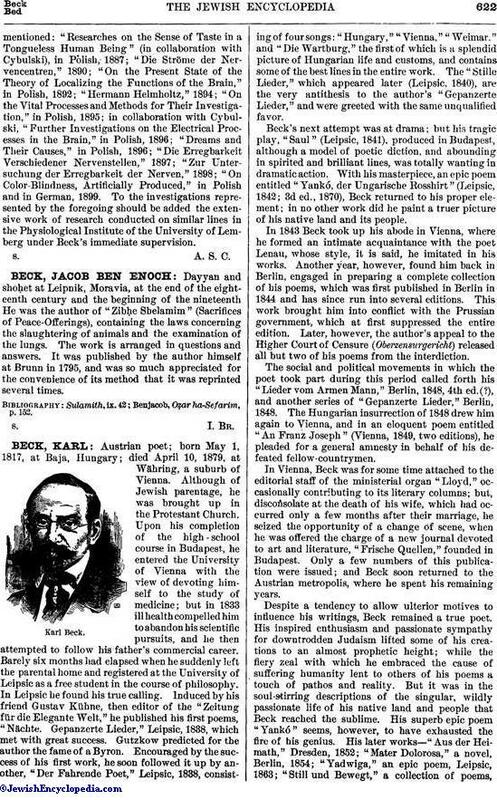 In 1888, while still a medical student, Beck gained the prize of the university by a paper on the excitability of a nerve, afterward published under the title, "O Pobudliwos'ci Roẓnych Miejsc Tego Samego Nerwu" (On the Excitability of a Nerve at Different Points). In 1890 he received the degree of M.D., and in the same year published the results of his extensive research on electrical processes in the brain. His papers on this subject, "Die Bestimmung der Localisation des Gehirn- und Rückenmarksfunctionen Vermittelst der Electrischen Erscheinungen," 1890, and "Weitere Untersuchungen über die Electrischen Erscheinungen des Hirnrinde der Affen und Hunde," 1891 (in collaboration with Cybulski), attracted wide attention in Germany, France, and England, and won for him a prominent position among students of physiology. 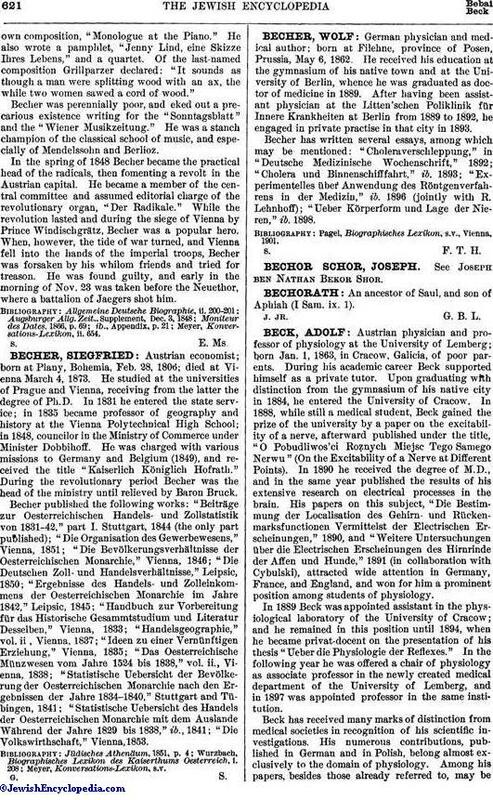 In 1889 Beck was appointed assistant in the physiological laboratory of the University of Cracow; and he remained in this position until 1894, when he became privat-docent on the presentation of his thesis "Ueber die Physiologie der Reflexes." In the following year he was offered a chair of physiology as associate professor in the newly created medical department of the University of Lemberg, and in 1897 was appointed professor in the same institution. Beck has received many marks of distinction from medical societies in recognition of his scientific investigations. His numerous contributions, published in German and in Polish, belong almost exclusively to the domain of physiology. Among his papers, besides those already referred to, may bementioned: "Researches on the Sense of Taste in a Tongueless Human Being" (in collaboration with Cybulski), in Polish, 1887; "Die Ströme der Nervencentren," 1890; "On the Present State of the Theory of Localizing the Functions of the Brain," in Polish, 1892; "Hermann Helmholtz," 1894; "On the Vital Processes and Methods for Their Investigation," in Polish, 1895; in collaboration with Cybulski, "Further Investigations on the Electrical Processes in the Brain," in Polish, 1896; "Dreams and Their Causes," in Polish, 1896; "Die Erregbarkeit Verschiedener Nervenstellen," 1897; "Zur Untersuchung der Erregbarkeit der Nerven," 1898; "On Color-Blindness, Artificially Produced," in Polish and in German, 1899. To the investigations represented by the foregoing should be added the extensive work of research conducted on similar lines in the Physiological Institute of the University of Lemberg under Beck's immediate supervision.